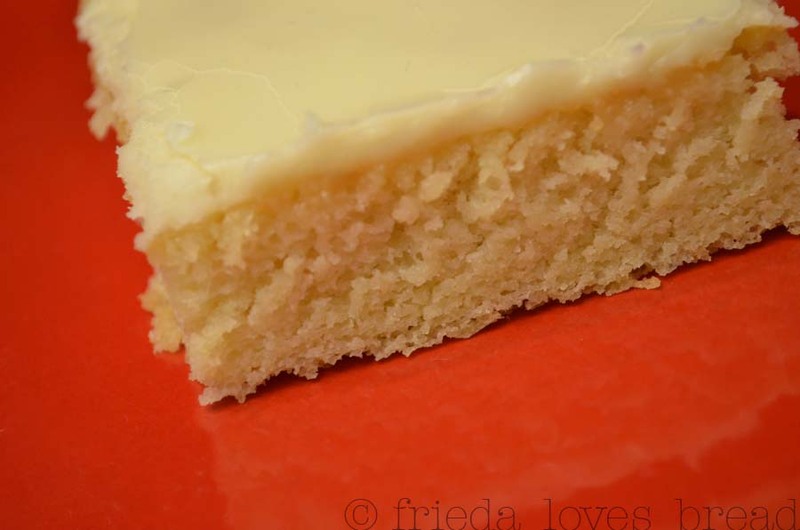 Frieda Loves Bread: Grammy's Vanilla Texas Sheet Cake: Fast & Easy dessert for a crowd! 43 Grammy's Vanilla Texas Sheet Cake: Fast & Easy dessert for a crowd! In the midst of a sea of sweet treats, desserts and chocolate at a church gathering, this little yellow cake caught my attention. "Oh, I'll just have a little bite," I said to myself as I cut myself a sliver. I went back and got another piece. A full sized piece and began my quest to find the creator of this elegant dessert. 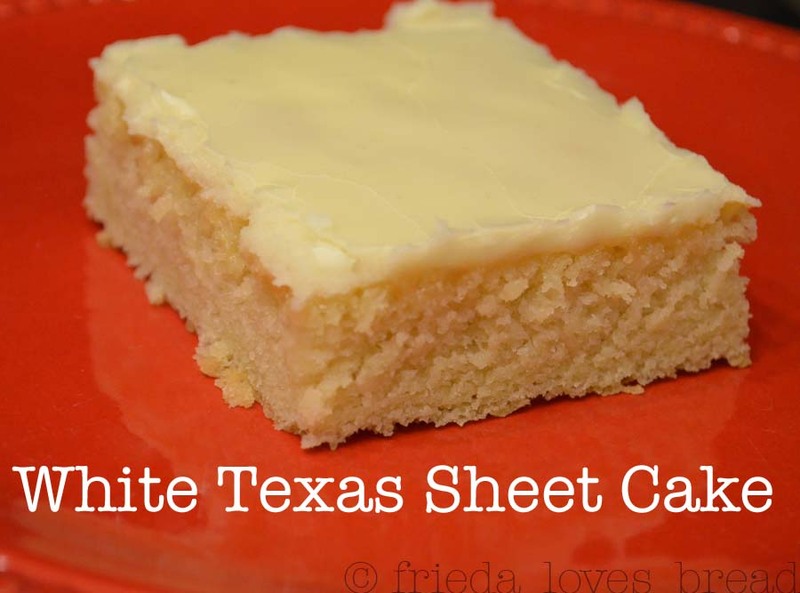 I jumped for joy when I discovered that my next door neighbor made this White Texas Sheet Cake, a recipe from her "Grammy" and gave me permission to share it with you. I grew up with the chocolate version and had NO clue this buttery vanilla version existed! This recipe is incredibly EASY, and can be finished and ready in an hour. In a large microwave safe bowl, melt the butter and water. Yes, I know it sounds unorthodox, but trust me, this recipe has been around a lot longer than you and me. Once melted, add your sugar, flour salt and baking soda. Beat smooth with a wire whisk. When smooth, add eggs and vanilla. Stir in sour cream or homemade plain yogurt. 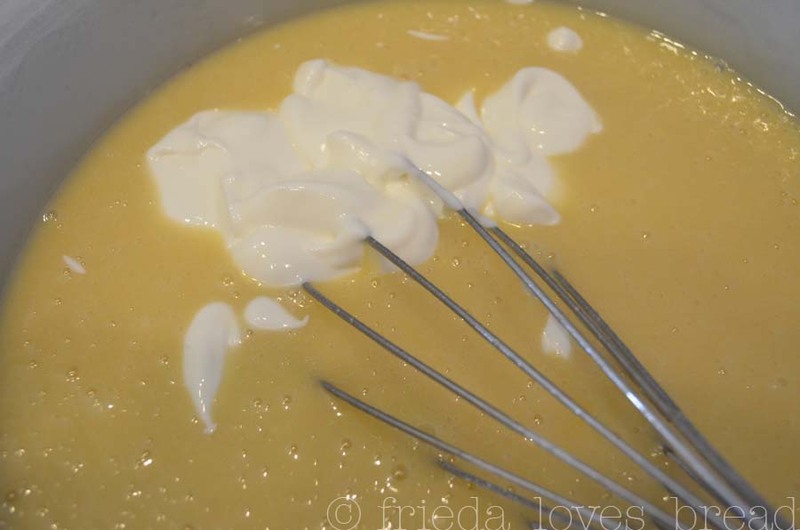 The acid in the sour cream or yogurt reacts with the baking soda, helping the cake rise and create a moist, tender crumb. Pour the cake batter into a buttered and floured 11"x17" baking sheet, also known as a "half sheet" baking pan. You can halve this recipe and bake it in a 9"x13" pan or use the batter to bake cupcakes. The bake times are listed in the recipe. Bake for 20-25 minutes. Remove from the oven and make the frosting. 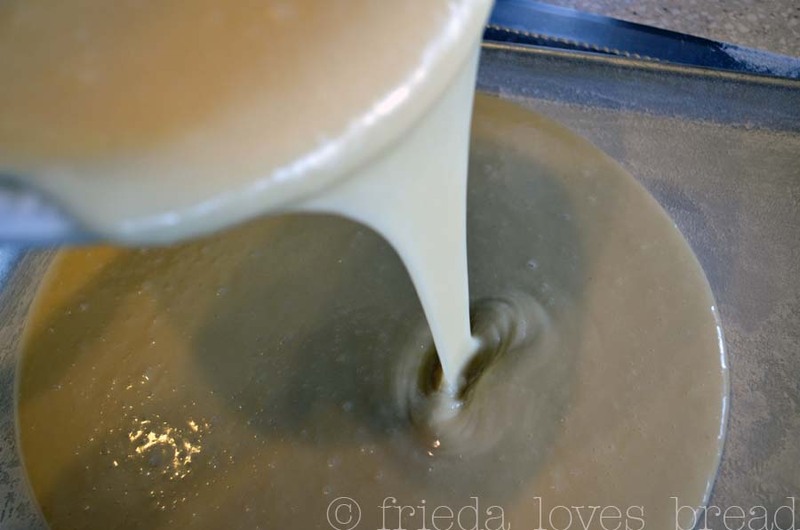 The butter and evaporated milk are put into a microwave bowl and melted for 3-4 minutes. Add powdered sugar and vanilla and whisk till smooth. You can add chopped pecans on top, but when serving to a crowd, you may not know who has allergies. Crushed peppermint candies is popular during the holidays, or fresh fruit, like raspberries, are wonderful toppings. It only takes minutes to whisk this super easy & rich cake for a crowd! No special equipment is necessary to make this cake - mixing it by hand ensures a fluffy, moist cake. Top with fresh berries, chopped nuts, sprinkles, or even crushed peppermint candies for a festive treat. 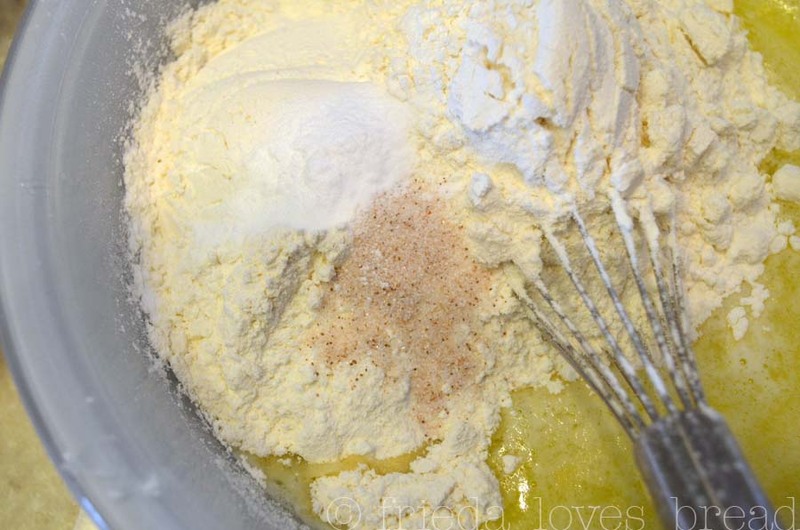 You can halve this recipe, cook in a 9x13 pan or even make cupcakes with this batter. 1. Put butter and water in a large bowl & microwave for 2 minutes on HIGH. You can also choose to melt your butter and water in a medium saucepan over medium heat on the stove.2. Stir with a whisk until all the butter is melted.3. Add sugar, flour, salt, and baking soda. 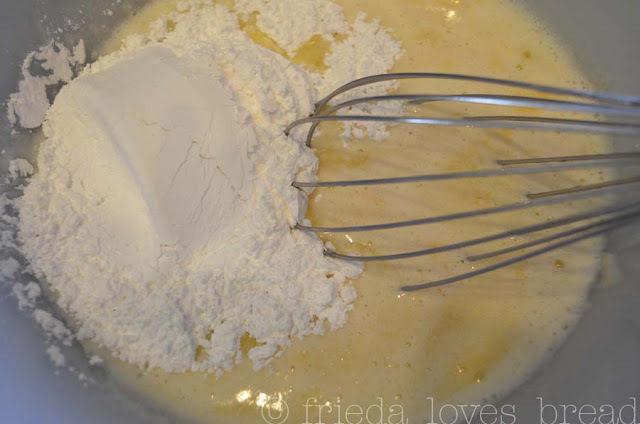 Whisk until smooth.4. Add eggs and vanilla extract, stirring well.5. Stir in sour cream or yogurt, until all is blended.6. Grease and flour a 11"x17" baking sheet, tapping off any excess flour.7. Pour batter into prepared pan. 8. Bake in a preheated 375°F oven for 20-25 minutes, or till cake springs back when lightly touched or when toothpick inserted in the center comes out clean. 9. Remove cake from oven and set on an heat proof surface. 10. Prepare the frosting: Melt butter & milk in a medium bowl on HIGH for 3-4 minutes in the microwave, or in a saucepan over medium heat on the stove. Add powdered sugar, vanilla extract and a pinch of salt. Whisk until smooth. Add nuts and gently spread on warm cake. Cool cake for about an hour and serve. Frieda, This looks so good. What a nice alternative to the chocolate sheet for a large crowd. I may take this to Christmas Eve dinner with the extended family. Do you think it would be good with crushed peppermint in the frosting? Maybe I would need to adjust the flavorings a bit. What do you think? Yes, Bonnie, I think it would! The crushed peppermint candies may "melt" into the frosting ~ I thought about adding it on top, but they wouldn't stick, as it is a glaze and it dries quickly. Saw you on Bonnie's blog and I came over for a visit. I am really glad I did. This looks fabulous. Your story of just a bite reminds me of mine that I just posted last month for Browned Butter Brownies. I did the same thing, one bite and another and I had eaten several pieces. Sounds like a great recipe year round. Wow. I love Texas Sheet Cake, so this one will definitely make it into my repertoire of cakes. Have to pin this! I would think if you added the peppermint immediately after icing the cake it should stick. I use pecans with regular Texas Sheet Cake and I put them on after the icing and they stick. I made this cake today. It was so delicious. I took it to an ornament party and it was a hit. I came home and "pinned" it to Pinterest. I had several people ask for the recipe. Thanks for another great one! Thank you! I'm happy to hear that it was a hit! Say am I just tired but how much of each ingrediant is used to make this cake. Lisa, sorry to hear you are tired ~ you must be extrememely busy and deserve some cake! Look just below the last picture of cake in my post. You will see the name of the cake and in parenthesis are the recipe links. 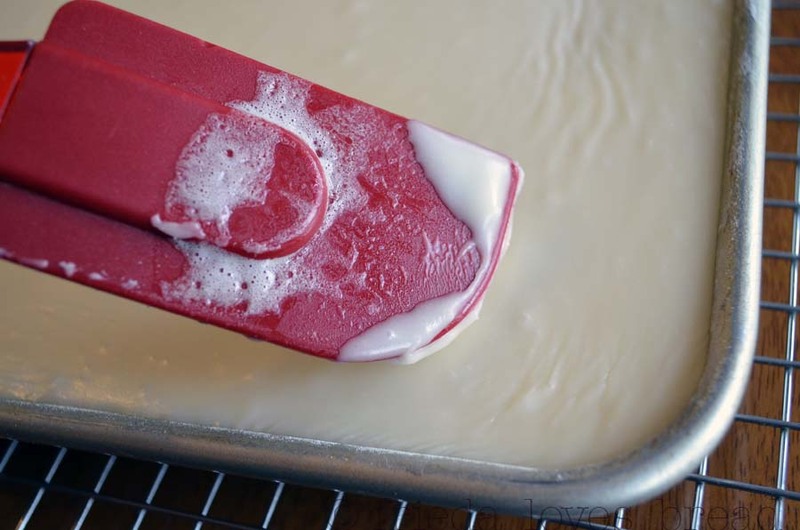 Click on either the 4x6 or full page, and you'll be directed to the recipe, ready to print. Happy holidays! Awesome, Thanks bunches & yes its a tired thing am on a 16 day straight with work! Thanks so much for the help, yet I feel silly for not seeing the connection. Frieda, this is beautiful! I never heard of a White Texas Sheet Cake before. It seems so "dainty" for something out of Texas;) Tell you neighbor that we love it. Your pictures are beautiful, as well (dig the action shot of the perfectly poured batter). Everything you post makes my mouth water! Looks delish!! Hi. Have just had a go making this fabulous sounding cake (its in the oven as I type) but I just wanted to check a few things with you. I'm Australian (don't hold that against me) so the 1 cup of butter thing threw me abit. I googled it and think its about 250gms. Does this sound right? Also some ingredients called for say, 1 T of something. Tablespoon or teaspoon??? I have taken guesses. Can you clarify bait. Wish me luck! The icing tastes great already BTW. Oh, to be able to WEIGH ALL my ingredients! And hooray for Google, huh? I did check a couple of sites and the consensus is 227 grams for 1 cup of butter. I do abbreviate my measurements and may have to re-think that for my international readers ~ 1 T does equal 1 Tablespoon. The small "t" is for teaspoon. Good luck and thanks for stopping by! Thank goodness Pinterest brings me to kick booty older posts on awesome blogs!! Can't wait to try this out and keep finding more yumminess on here! 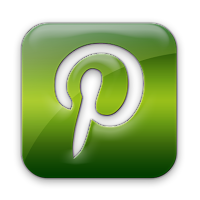 We can't imagine our lives without Pinterest, can we?? I'm finding too many yummy things as well and not enough time to bake them! I am sure it will taste great! Depending on where you live (humid vs. dry climate), your powdered sugar may be lumpy to begin with. (Not your fault!) Try sifting your powdered sugar after measuring it and it will blend it easily. Oh my goodness. This looks DELICIOUS! Quick question do you think I could make this for a park birthday party? Like do you think the frosting can hold up outside? I think it would. The frosting is thin and develops a crust when dry. If you live in a very humid climate, I would put the finished cake in the fridge for a couple of hours before taking it to the park. Give it a try and let me know how it turns out! oh that is a good idea...putting it in the fridge... thank you for replying! I'll let you know in a few weeks. This cake is simply amazing! I made it and took it to my physical therapists, and they loved it! Thanks for the recipe! You're welcome, Donna! How sweet of you to make it for your PT! Thank you, thank you, thank you for posting this recipe! It is now my go to vanilla cupcake recipe, after trying out 6+ vanilla cake recipes, this is by far the best, it is the only vanilla cake I've ever had that actually melts in your mouth, so delicious! You're welcome! How fun that you make these into cupcakes! Wow a pound of butter! no wonder it's so good!! Yes, a pound of butter ~ but it also makes a very large cake! You can try plain Greek yogurt. Let me know how it turns out for you! Just made these yesterday for my kid's birthday, it's really DELICIOUS and everyone loves it. Thanks so much for the easy recipe!! You can use milk, but try to use whole milk or even 1/2 and 1/2 to get the glazed consistency needed for this cake. If you use skim, it may be too runny. Hi! Do you think I should double the recipe to make two 9 x 13 pans? I am looking forward to trying this delicious looking recipe! Thanks for sharing! If you make a single recipe and put it into a 9x13 pan, it will be a lot thicker than a traditional Texas sheet cake, and will take longer to bake. Also, you would need less frosting. This is such a moist cake, I am not sure how it would do as a thicker cake, but a reader used this recipe and made cupcakes, so it may work! When baked, this sheet cake is only 1 inch thick. I believe the batter only comes up to 3/4" in the pan. You can double the recipe and put it into (2) 9x13 pans with 3/4" batter, but you will have left over batter, but you can make cupcakes, which as a previous reader did. Yes, all purpose flour will work. Salted butter for both the batter and the frosting. Taste the frosting first and add a dash of salt, if needed. I just made this for a potluck! The frosting is delicious! I will let you know after tomorrow how my cake turned out! I am so excited. This cake was completely consumed at Squadron Christmas party! Everyone LOVED it. This will be my new go-to recipe for potlucks in the future!!! Thanks for posting. You are welcome! That's right, there are NO leftovers when this cake is brought to a gathering! Thanks for posting your sweet comments and review! I have had this recipe for years and I agree that this vanilla cake is simply delicious as written. YUM!!! Also toast a few slivered almonds, and sprinkle them over the glaze immediately upon frosting. The nuts will stick to the frosting if you work fast...the frosting tends to set up very quickly! I would really like to make this but I do not see the amounts (quantities) for each ingredient for the cake or the icing. Hi ~ if you scroll down to the bottom of the post, you will see the words, "Grammy's White Texas Sheet Cake" with two choices in parenthesis: 4x6 recipe download or full page printable recipe. 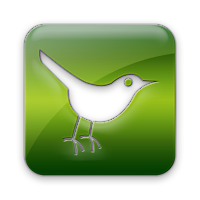 Click on either one of those green links and you will be able to see the recipe AND print it ~ Enjoy!